Creating a contact history table, string concatenation, contact history report, more form and report tricks. 70 Minutes. In this course we're going to begin building a Contact Management System. A �contact� is every instance of communication with a customer � via phone, in person, email, etc. We'll begin by building a table to store all of the contacts with our customers. Next, you'll build a contact query, so that you can get - for example - a list of all contacts between two dates - of course the user can type these dates in when the query runs using parameters. We'll learn about string concatenation - or taking two text fields (like First Name and Last Name) and smashing them together into one Full Name field. 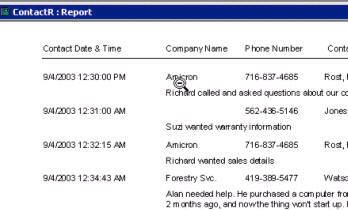 Next we will make a contact report - showing all of the contacts for each of our customers. We'll learn about the Can Grow and Can Shrink properties in reports - which will allow certain fields (like our notes fields) to grow to fit the data in them. 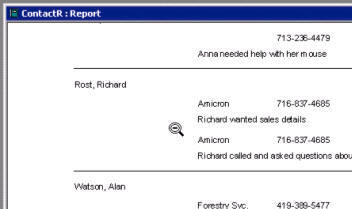 Then we'll learn about Sorting and Grouping levels in reports - so that we can turn group headers and footers on and display all of a particular customer's contacts together in the same group. Finally (with reports) you'll learn how to use the Page and Report Headers and Footers to put a classy title at the top of your report, and Page Numbers at the bottom of each page. 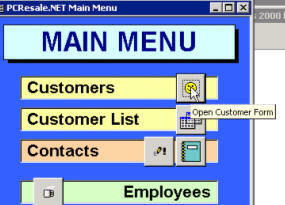 We'll go back to our Main Menu and add buttons for our new contact management features. We'll also create Tooltips on them (you know - those little yellow text boxes that pop up to tell you what a certain button does when you hover over it). If you're interested in building your database into a professional-quality contact manager, this is the course for you. Say goodbye to your old Rolodex or Act! software. We're going to make Access do everything for you! By the end of the next few classes, you'll have something very powerful to use... and you can customize it to do exactly what you want it to!